What is a LM Code? 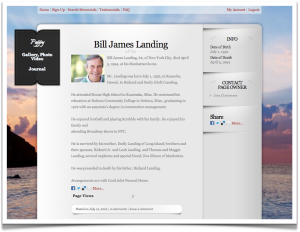 Creating a Legacy Memorial Online: As Easy as 1-2-3! Ready to get started? All you need to do is register.Follow the prompts as you enter content such as text (obituary, biography, stories, etc. ), documents, photos, and home video. Capture the personality of your loved one with complete control of the look and feel of the memorial with our beautiful backgrounds or upload your own custom background. 1) From the home page, simply click “Search Memorials” and enter the name of your loved one in the search bar at the top of the page. After clicking search, a list of close or matching memorials will then be displayed. Find your loved one in the list, click on their name and enjoy reliving your precious memories. 2) You may also access the memorial(s) you have created from your account. After logging into your account, click “My Account” at the top right of your screen, and then click “Manage Memorial” located above your account details. From here, you can view a list of all the memorials you’ve created. You may then view your memorial(s), edit content, publish/unpublish, approve comments, invite friends, and even transfer your memorial to another friend or family member. 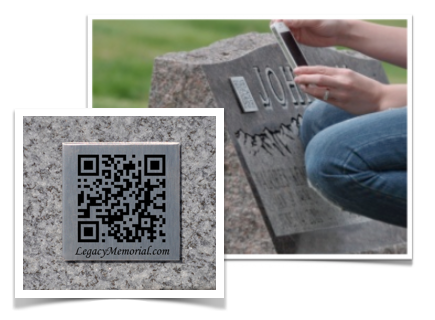 1) Legacy Memorial has teamed up with BillionGraves™ to offer the latest advances in technology. 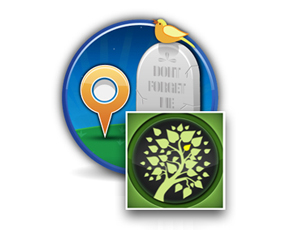 Users who purchase a lifetime memorial featuring BillionGraves™ will be able to access their memorial by attaching our legacy marker directly to the headstone of their loved one. Once attached, simply download a mobile scanning app and scan the code with any Internet accessible mobile device to display all the content of the memorial. 2) Coming Soon! Users will be able to access their memorial by simply taking a picture! As we incorporate BillionGraves™ and LegacyTec™ technology, memorials and additional family history may be accessed from the headstone using image recognition and GPS technologies. Once this technology has been fully implememted, you will receive an email with information on accessing this technology. Allow your family and friends the opportunity to honor your loved one by sharing your memorial on all major social networks. 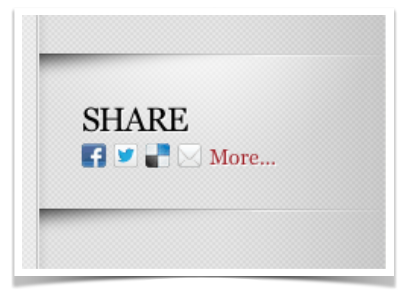 Simply click on the social network button on the bottom right of the memorial page to begin sharing.